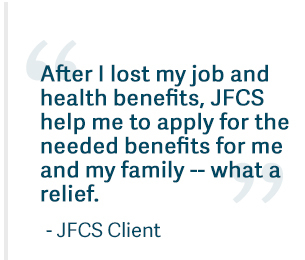 If financial burdens overwhelm you and you’re confronted with choosing between essentials like paying the rent or buying medication, you can turn to Jewish Family and Children’s Service of Greater Philadelphia. One of our primary goals is helping members of our community become financially stable, either by providing a plan that incorporates access to public benefits, directing a client to special funds, or guiding them to local or regional resources. Our staff is expert at navigating the public process and policies, including the paperwork that might be required to maximize accessible funds—valuable help through a challenging process and at a difficult time.